One of my favorite things about writing a Food Blog, is when someone gives me an item and tells me to try & review it for the blog. Now, this doesn’t happen all too often but, when it does, I am beyond excited. Hopefully, one day, Grandma’s Backyard will be one of the top Food Blogs and I will receive countless free items from every food company & restaurant imaginable. Until that day comes, I rely on my followers, readers and friends/family to supply this. Last week, the CEO of my company, hooked me up. Well, let’s just say that he let me Zero On In. I was presented with the Zero Candy Bar and knew right away – try & review. I have seen the Zero bar before – it’s not your typical candy bar but, it can be found in local stores. For no particular reason, I have never tried one. 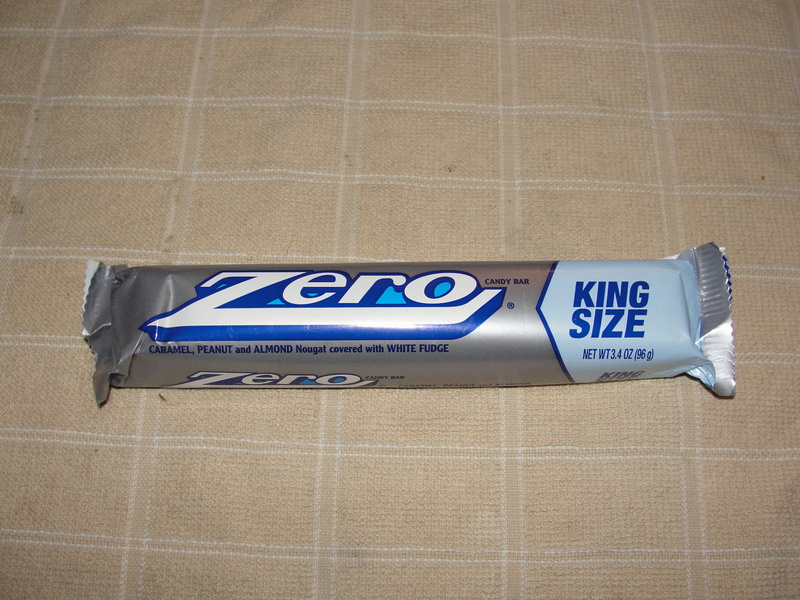 But now, I was presented with not just a Zero Candy Bar but with a Zero King Size Candy Bar. I brought it home and tried it in the evening after dinner. The package is pretty spiffy looking – I love the futuristic silver-gray look. It is described as, ‘Caramel, Peanut and Almond Nougat covered with White Fudge.’ I had no idea what to expect so, I ripped it open and dove in. At first glance, this looks so odd. Since it is covered in White Fudge, rather than the more-common milk chocolate, the appearance takes you back. I cut off a piece and examined the layers. 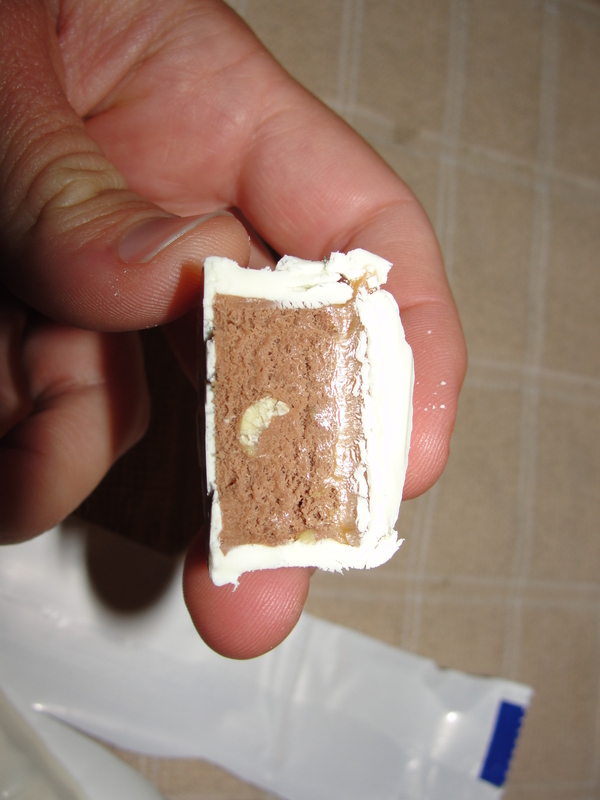 The nougat was by far the largest part of this bar and I could see a sliver of a nut within the nougat. The top of the bar contained a thin caramel layer. And, all of this was covered in white fudge. I stuck the first piece in my mouth and began to chew. Where was the candy bar? Was I truly eating Zero? As odd as this sounds, that is almost what this was like. The large amount of nougat makes this bar feel light and airy. I was expecting this to be crazy sweet however, I found the sweetness to be just right. The white fudge was there but, really didn’t play too big of a role. The key factor in this bar was the combination of nougat. I don’t believe I have ever had a bar that was both Peanut & Almond Nougat. While there were some slivers of nuts, most of the flavor came from the nougat itself. Rather than being very sugary, I could taste the infusions of peanut and almond within the nougat. The caramel layer was not huge however, it provided a little touch of flavor and a different consistency. 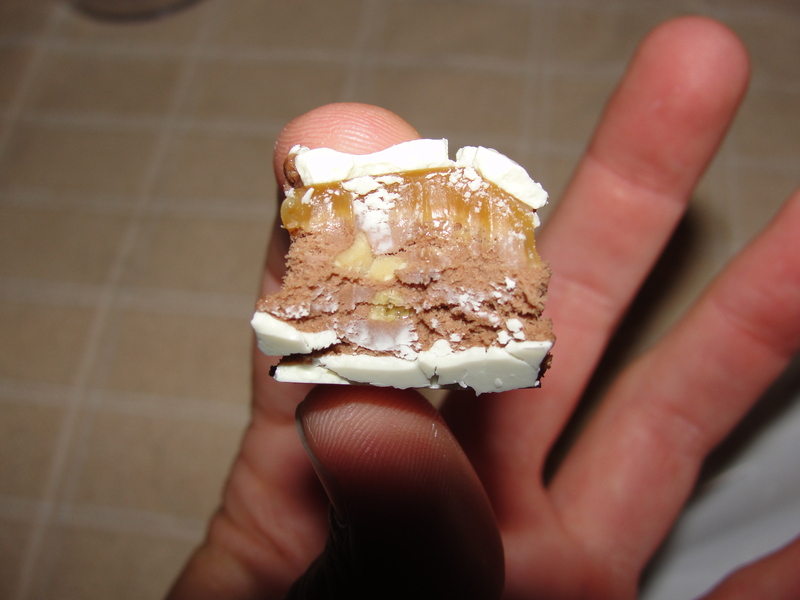 I liked how the caramel paired with the nougat – it tasted quite nice together. The only part of the bar that was in the background was the white fudge. Normally, white chocolate is more sugary than milk chocolate. 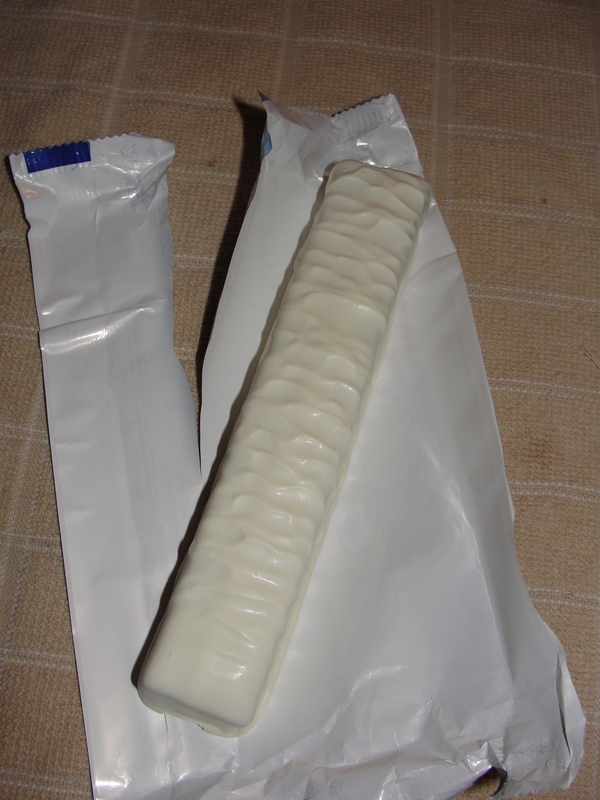 I found the white fudge covering this bar to be neither too sweet nor too delicate – it provided just a touch of flavor. I would have liked for this to be a little more apparent however, this did not hurt the overall flavor of the bar. Every bite I had – 3 in total – were quite delicious. This bar really has the right name. Whereas filled candy bars are normally thick & chewy, I found this bar to be airy & light. I did not feel like I was on a sugar high after my 3 bites nor did my jaw get a workout while eating this. While I don’t think I would go out of my way to purchase one of these – I really only ever buy candy for consumption with Grandma’s Backyard – I would have no problem eating one of these again. Remember readers, followers & family/friends – if you give it to me, I will try & review it. I love having direct contact with you all. In the case of this candy bar, I was able to Zero On In. Nice. I was wondering the other day if they still make zero bars. I’ll have to pick one up. My favorite way to eat a Zero bar is frozen. When I was growing up and we would go to the public pool they would sell frozen zero bars for 50 cents. I will have to try that out!